Can you hear me screaming over here? That would be me screaming with excitement because it's Friday. I have worked more hours this week than I care to mention, so today is a very welcome day! What's up for the weekend? Other than a few hours of work, I'll be breaking my normal eating habits at a new brunch spot which will be followed by a LONG nap, doing some online shopping for spring and continuing to read this book that I mentioned here last week. It is SO good, personable and extremely informative on so many levels! Here are some good links for you! I hope you have a wonderful weekend. Since Google Reader is going away (totally not cool), you can follow Savor Home here via Bloglovin or here via Feedly. You can import your Google Reader into each of those platforms! Weekend shopping: 25% off & free shipping at J.Crew on orders of $150+! 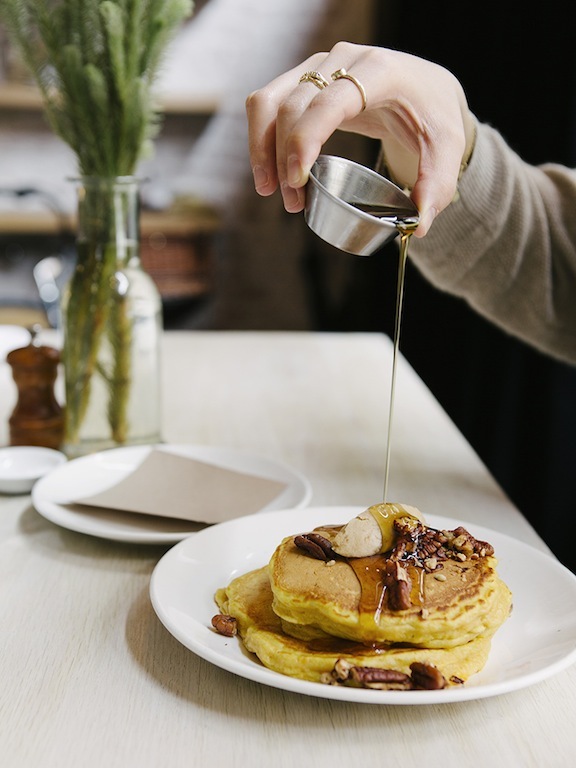 Oh my, pancakes with pecans and maple syrup! Thanks for the shout out Tiffany!! Once I get some followers I will do the same for sure!! Ok, now I am craving pancakes...depending on tomorrow's weather I might have to talk hubby into a trip to the Original Pancake House. Picked up The Honest Life (thanks for sharing). Love what I have read thus far. Stay Warm!! Oh yes to pancakes...woke up craving them this morning..I may just have to bust out the griddle. These look so good! I'm late on this post but just got through all of your links as I'm up in a hotel room right now so it was a nice way to spend the evening. LOVE THOSE LINKS! The rainbow pancakes blew my mind!